Soros-funded Gigi Sohn falsely accuses me of being AT&T funded Tech at Night: It is urgent that we stop SOPA; Google wising up? 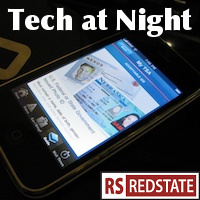 It turns out it’s not just a few of us on the right who know Tech at Night exists. Gigi Sohn says Tech at Night shapes the debate along with good old Less Government. Of course, Sohn also told a lie about me and claimed AT&T pays me, but… that’s the head of a Soros-funded group for you. Media Marxists and all that. Something I did not know: Millions of Americans are getting subsidized wireless. And gee, they’re using it to replace home phones rather than as a mere supplement, draining money from the government right to Sprint. But we’re supposed to think they’re the victims of unfair competition. Right. Sadly the Congress is busy trying to regulate the Internet instead of trying to end wasteful subsidies. The Net Neutrality repeal failed in the Senate (and look at the angry comment Seton Motley got! ), as the Democrats refused to control the Obama FCC’s excesses. ACLJ warns of the problems with SOPA and PROTECT IP, the national Internet censorship blacklist bills I won’t stop going on about. This truly is a basic free speech issue. We’re talking bout censoring the Internet because American law doesn’t extend overseas. It’s foolish because it expands government, threatens our liberties, and can’t actually achieve much beyond threatening America’s Internet leadership. Yeah, and I definitely don’t want even more federal regulations of sports in the form of anti-blackout rules, either.